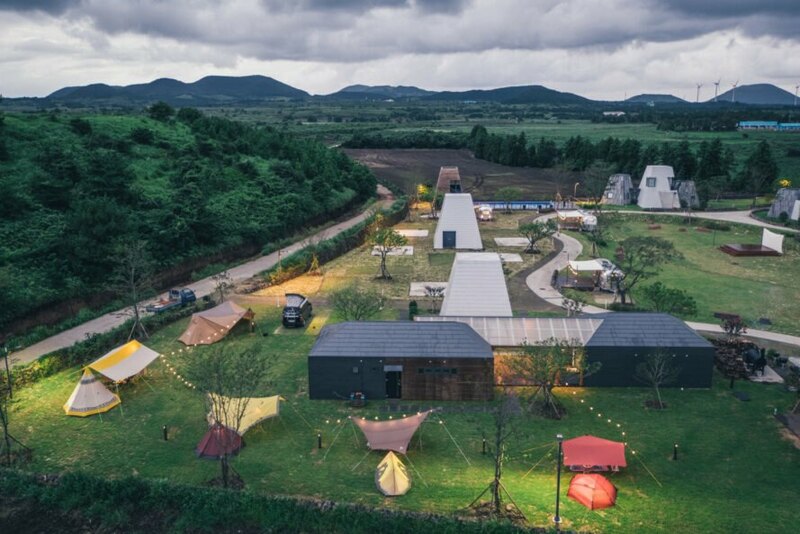 Visitors to the remote South Korean island of Jeju may want to book a stay at the vibrant glamping location Around Follie. 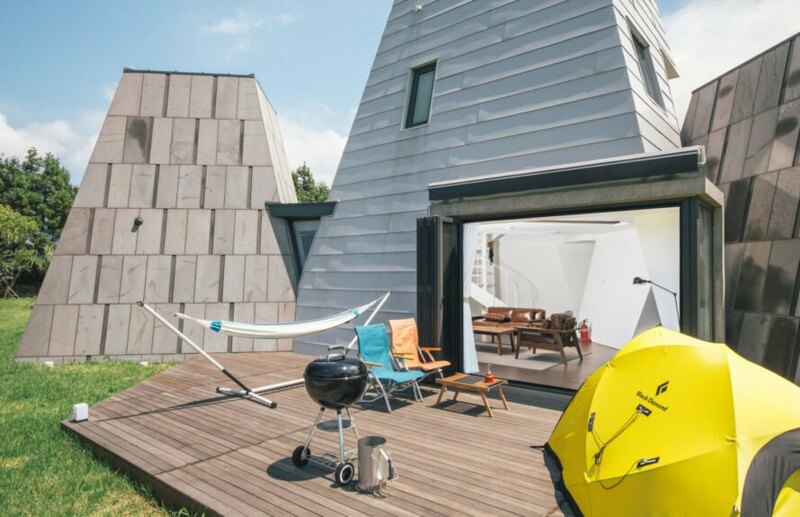 Designed by Seoul-based firm Z_Lab, the campsite, which is located on large lot of land adjacent to a defunct volcano, is made up of seven modern huts, three restored Airstreams and a number of camping sites for those who travel with their own tents. 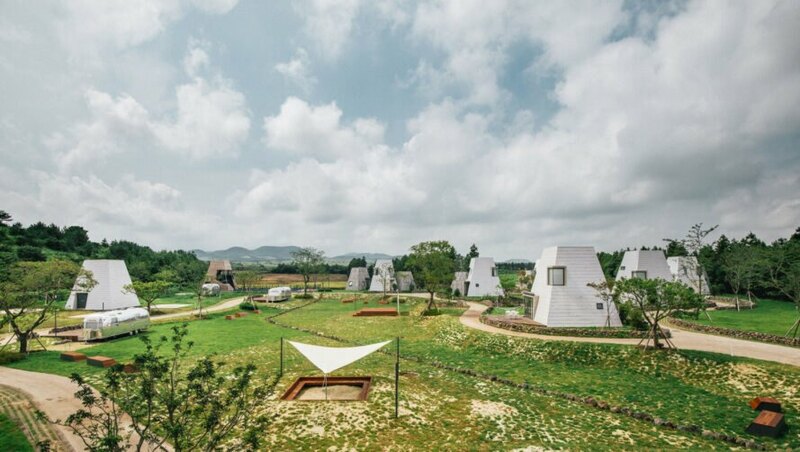 According to the architects, they wanted the glamping site to be a place where guests can fully immerse themselves in Jeju’s incredible landscape. With a wide walking path connecting the guest rooms, the layout was meant to provide visitors with the strong feeling of community. The individual huts are all spaced strategically to give guests privacy while still fostering the idea of people coming together to enjoy the outdoor experiences. The main lodging on site is comprised of seven individual huts in shapes reminiscent of modernized pyramids. The pyramid lodges come in four sizes: loft, twin, suite and pool villa. The interiors are bright and airy with minimal furnishings. Most of the cottages have a large wooden deck for dining al fresco or just taking in the fresh air. A fun feature is the open-air rooftop bathrooms, with a large tub to enjoy a bit of star gazing while enjoying a warm bubble bath. For those looking for more of a vintage atmosphere, there is also the option of staying in one of the three reformed Airstreams. The three RVs are each a different size and have been completely renovated into modern guestrooms. They have built-on wooden decks to enjoy the beautiful views that surround the campsite. The glamping site also offers a barbecue restaurant and café located in the large reception, which features a green-covered rooftop with an observation deck. Within Around Follie, there are plenty spaces for events and cultural programs year-round, another feature aimed at bringing the community together. Wow! Best glamping site ever! 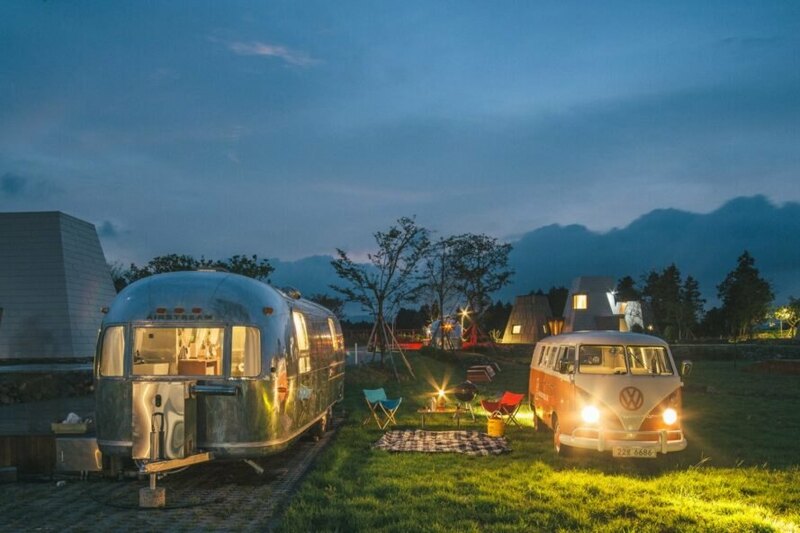 The Around Follie glamping site is located on the South Korean island of Jeju. The glamping site offers a number of lodging options. In addition to huts and Airstreams, guests can bring their own tents to the site. 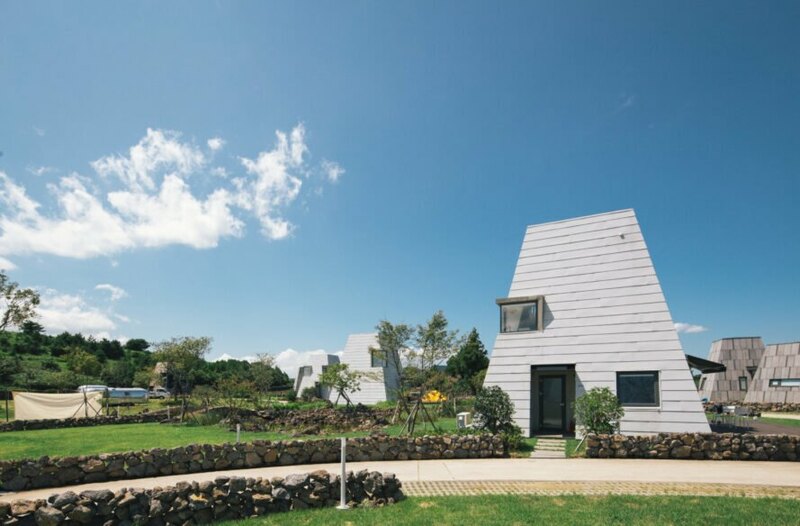 The architects designed the glamping site so that guests could enjoy the beautiful nature of Jeju. The modern huts come in a variety of sizes. Guests can stay at the large pool villa. Most of the lodgings have an outdoor deck to enjoy the fresh air. 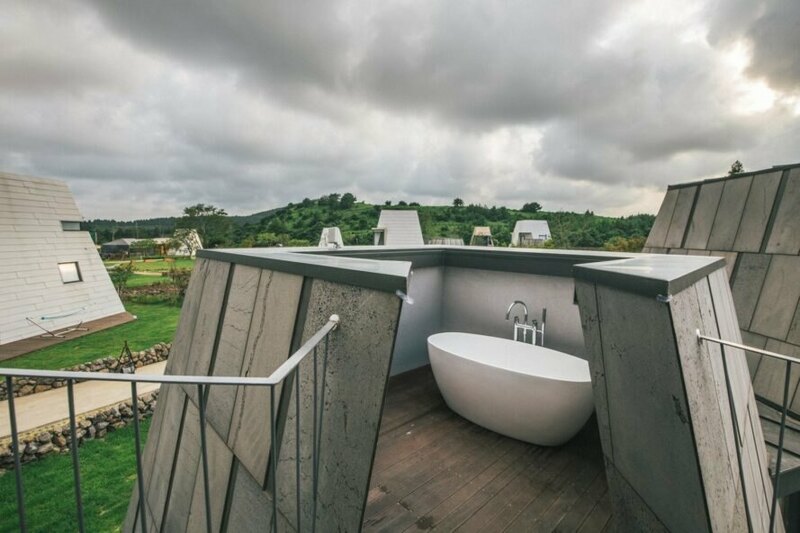 A rooftop bathroom is a fun feature of the hut design. The interior spaces are bright with minimal furnishings. The huts have all of the comforts of home. 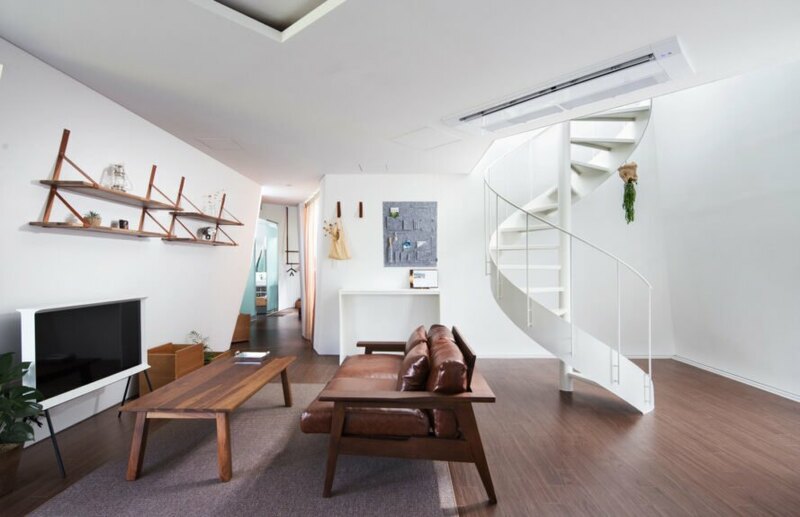 A winding staircase leads to the upper floors. The huts can sleep up to six or eight people. The bathrooms are located on the upper floor and have open roofs. Guests can also reserve a stay in one of the three renovated Airstreams onsite. 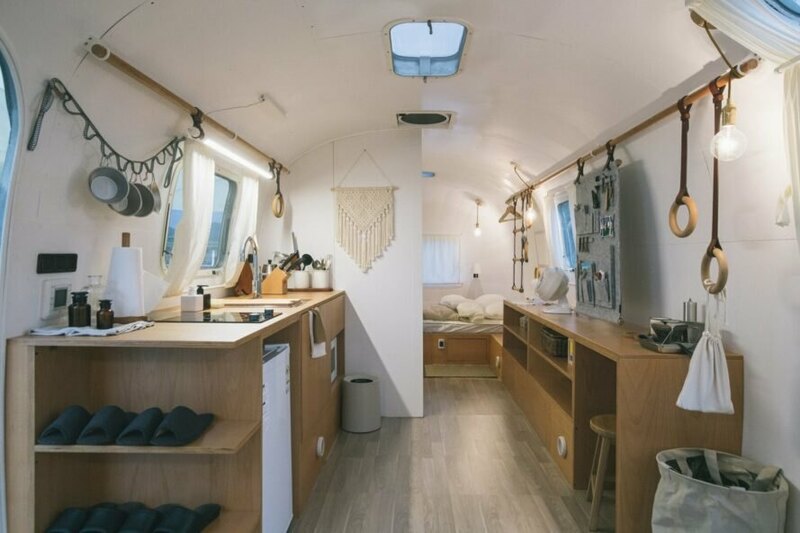 The interiors of the renovated Airstreams have a vintage feel. In addition to lodgings, the site also has a restaurant, a cafe and an observation deck. Overall, the glamping campsite provides privacy while also fostering a sense of community.